(18) Thus circumambulating Him and offering his obeisances, Sudars'ana took leave. He returned to heaven and Nanda was delivered from his awkward position. (19) The men of Vraja witnessing Krishna's personal display of power stood amazed. Thereupon they on the spot finished their duties [unto S'iva] and returned to the cowherd village, oh King, [on their way] with reverence recounting what had happened. Third revised edition, loaded December 15, 2013. S'rî S'uka said: 'The gopas one day eager for God with bullock carts went on a trip into the Ambikâ forest. There they took a bath in the Sarasvatî and worshiped with paraphernalia devotedly the mighty demigod Pas'upati [S'iva as the lord of the animals] and the goddess Ambikâ [*], oh King. Respectfully donating cows, gold, clothing and sweet grains to all the brahmins, they prayed: 'devo nah prîyatâm' [may God be pleased with us]. Following strict vows only drinking water [see 8.16] the highly blessed Nanda, Sunanda [Nanda's younger brother] and the others stayed that night on the bank of the Sarasvatî. 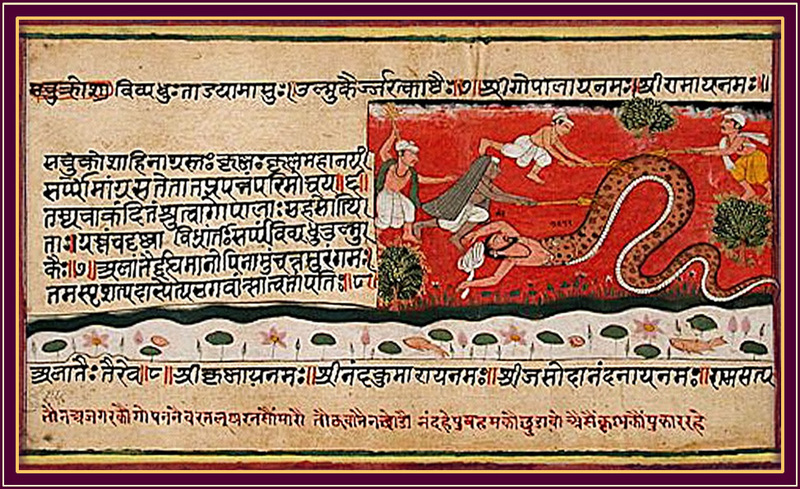 Some giant snake that was very hungry happened to live in that forest and slithering on his belly began to swallow the sleeping Nanda. 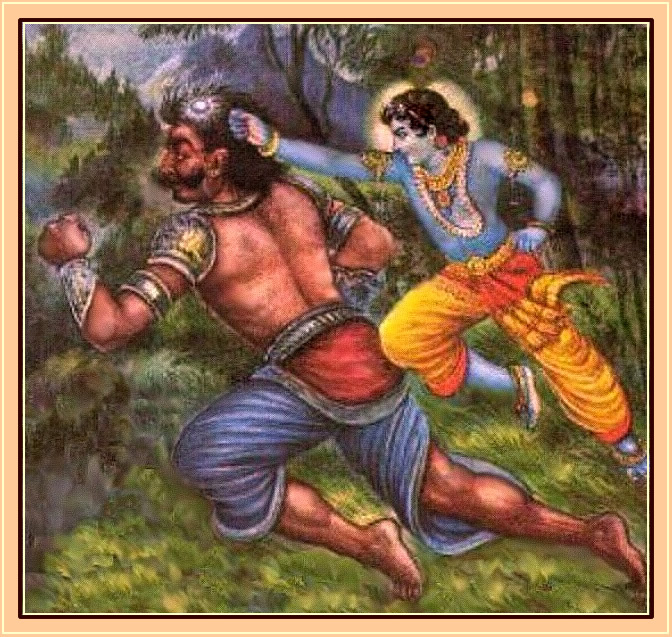 Hearing his cries the gopas rose immediately and seeing what happened they perplexed took up firebrands to attack the snake. The snake, despite being burned by the torches, did not release Nanda. But the Supreme Lord, the Master of the Devotees came and touched him with His foot. The divine touch of the Supreme Lord's foot put an end to his badness. He gave up his snake body and next assumed a form that was worshiped by the Vidyâdharas [he was their leader]. The Lord of the Senses then questioned the personality who, offering his obeisances and with his body adorned with a golden necklace, brilliantly shining stood before Him. The [erstwhile] serpent said: 'I am Sudars'ana, a certain Vidyâdhara well-known for his opulence and appearance. I used to wander all the directions in my celestial carrier. Because I, conceited about my appearance, ridiculed the sages who descended from Angirâ I, for my sin of deriding them, was made to assume this ugly form. They, in their compassionate nature, with pronouncing their imprecation included the favor that all my viciousness would be destroyed after having being touched by the foot of the Master of All Worlds. I beg You, that same person who for the surrendered souls are the remover of the fear of a material existence, oh You who by the touch of Your foot freed me from the curse, for Your permission [to return to my world], oh Destroyer of All Distress. I am surrendered to You, oh Greatest of All Yogis, oh Supreme Personality, oh Master of the Truthful Ones. Please command me, oh Lord, oh Controller of all the Controllers of the Universe. Thus circumambulating Him and offering his obeisances, Sudars'ana took leave. He returned to heaven and Nanda was delivered from his awkward position. The men of Vraja witnessing Krishna's personal display of power stood amazed. Thereupon they on the spot finished their duties [unto S'iva] and returned to the cowherd village, oh King, [on their way] with reverence recounting what had happened. Some day thereafter [at Gaura-pûrnimâ so one says] Govinda and Râma, whose deeds are so wonderful, in the middle of the night were playing in the forest with the girls of Vraja. Their glories were charmingly sung by the group of women bound in affection to Them, whose limbs were finely decorated and smeared, next to the garlands and the impeccable clothes they wore. The two of Them [together with them] honored the nightfall with the appearance of the moon and the stars, the jasmine buds that with their fragrance intoxicated the enjoying bees and the breeze that transported the fragrance of the lotuses. They both, for the mind and ears of all living beings, sang about the fortune, together from high to low producing the entire scale of notes that was available. The gopîs who listened to Their singing, in their fascination did not notice oh ruler of man, that their dresses slipped and their hair and flowers got disheveled. While the two thus were amusing Themselves to their heart's content, singing to the point of ecstasy, a servant of Kuvera arrived on the scene carrying the name S'ankhacûdha ['wealthy-crest']. Right before their eyes, oh King, he shamelessly drove the group of women away in the northern direction, while they were crying out to the Two they had chosen as their Lords. Seeing that they who belonged to Them were seized by a thief like a couple of cows and were crying out 'Oh Krishna, oh Râma, help us! ', the two brothers ran after them. Calling 'Do not be afraid' They comforted them with Their words. They moved quickly with s'ala logs in Their hands and soon caught up with that worst specimen of all Yakshas who was speeding away with great haste. When he saw the two approaching like Time and Death personified, he became afraid. In his confusion he left the women behind and ran for his life. Govinda pursued him wherever he fled in order to rob him of his crest jewel, while Balarâma stayed behind to protect the women. Overtaking him like it was nothing the Almighty Lord with His fist knocked off the crest jewel of the villain together with his head. *: Ambikâ means mother, good woman, a name scripturally associated with the femininity of Ûma and Pârvatî in relation to Skanda, S'iva or Rudra, as a term of respect. Ambikâvana is found in the Gujarat province, near the city of Siddhapura. S'rîla Vis'vanâtha Cakravartî Thhâkura quotes authorities here who claim that Ambikâvana is situated at the bank of the Sarasvatî river [that does not exist any longer] and is found northwest of Mathurâ. Ambikâvana is notable for its deities of S'rî S'iva and his wife, the goddess Ûma. The first painting is titled: 'The Python Swallows Nanda (Recto), Singeing of the Python (Verso)'. Folio from a Bhagavata Purana (Ancient Stories of the Lord). India, Rajasthan, Mewar, South Asia, circa 1600-1650. The second painting is by B.K Mitra.